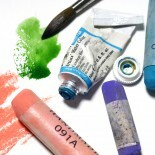 We are watercolor and pastel artists who meet on Wednesday mornings at the Capitol Hill Arts Workshop in Washington, DC, to create and learn. The group began in the late 1990s with watercolorists only, under the tutelage of Gina Clapp, a wonderful teacher and an outstanding watercolorist. A few of us from that original group are still part of the class after nearly two decades. New artists have joined the group as others have moved on, but the camaraderie, encouragement, and critical eye that are core elements of the Wednesday Studio have continued. Gina herself moved on in 2012 when she relocated to New York with her husband to take over nanny duties for their new granddaughter. Pastel artist Ellen Cornett continued on in Gina’s stead, and began teaching in pastels as well as watercolor. Some of us work in both. No matter the medium, all of us have grown and found advantages in working beside people using different materials. In 2014 we dubbed our group the Wednesday Studio. We have created this blog to write about our art and the art process, and to display some of our work, both finished and in progress. What a treat to associate with these talented group!